With summer right around the corner, it's time to start planning for your upcoming getaway. It's always exciting to visit a new destination. The anticipation leading up to a trip is almost as exhilarating as the trip itself. Selecting outfits, choosing a hip hotel, pinning must-visit restaurants, and looking at Insta-worthy spots beforehand are all part of the fun. When it comes to packing, it's easy to forget about the small things that can make your trip go a lot smoother. The best travel accessories that are $20 and under won't break the bank, and they'll make your next trip a breeze. Some of us start packing weeks before a trip with a checklist in hand. Then there are those of us who end up flying out of the door with our luggage half-zipped just an hour before our flight departs. Whether you're an early packer or a procrastinator, there will be some items that you just don't want to leave behind. Sometimes luggage is lost, essentials are left behind, travel documents are misplaced, or phones lose battery prematurely. These seemingly small mishaps can make your trip way more difficult than necessary. Some affordable, yet useful travel accessories will keep you fly (literally) and ahead of the travel game. Whether you're jetting off to New York or Paris, you can't forget to pack your passport. You can protect your most important travel document with this chic hot pink passport holder. This cute leather cover is perfect for the girl who likes to have a fun time, no matter where she's headed. This millennial pink makeup pouch is perfect for your carry-on essentials. Throw some mascara, lip balm, body spray, chewing gum, and bronzer into this pouch — and you're good to go! You'll be able to freshen up quickly after a long flight. Having a luggage tag on your bag is one of the easiest ways to keep your luggage safe. You'll be able to spot your luggage from a mile away with these colorful luggage tags. With this set of three, you can choose the slogan and color based off of your mood or wherever you're headed. Headed on a summer road-trip? Stock up on these wanderlust-inspired air freshener tags. Your car will stay so fresh on those long journeys. Are there any unicorn lovers out there? This magical pill box makes taking daily vitamins fun. You can store any prescription or over-the-counter medication inside as a friendly reminder. It's so important to stay healthy while you're on the road! This 35mm underwater camera is perfect for your upcoming beach trip. It's compact and you don't have to worry about ruining your phone. You can keep it old school by making a scrapbook of your all your travel memories under the sea. Getting rest on long flights can be the absolute struggle. Say goodbye to neck cramps and sleepless flights with this rainbow-colored neck pillow. It's cute AF and it will provide you all the support you need to rest up before you land in your destination. You don't have to worry about missing out on those Insta-worthy underwater shots anymore. This lime green waterproof phone case will protect your phone anytime you go for a swim or in the event of a sudden downpour. Are you a light sleeper? This red and pink eye mask has got you covered. This mask will help you get some much needed shut-eye, whether you've gotta rest on a long flight or in a hostel. If you haven't heard of packing cubes, you just might be living under a rock. 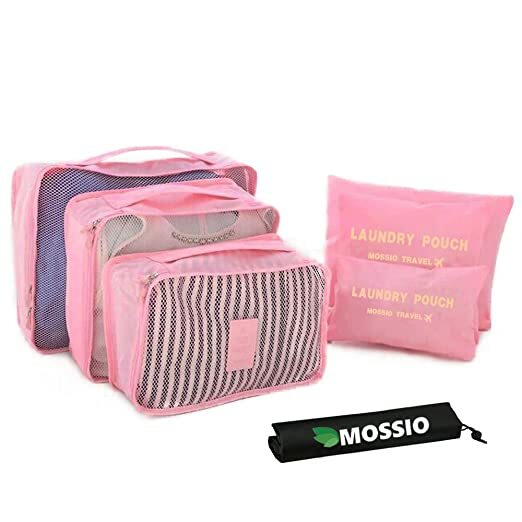 These compression packing cubes will help you squeeze all of your favorite clothes into your suitcase. They'll also help you stay organized while you live out of your luggage. You need these in your life, ASAP. Happy travels! You'll look so cute on your next trip with these useful travel accessories.